I can't believe there are no reviews for this ID yet! Tennin had been one of my favorites for a long time. Tennin is a fun deck because it forces the runner to run a more aggressively than they're used to, and, given the right tools, can be used as an interesting fast-advance/never-advance deck. Crisium Grid, Ice Wall, and Trick of Light are your best friends in this deck. Drop Crisium on HQ and R&D, and a couple of Shock!s, Shi.Kyūs into archives, and laugh as you pile up advancements on Ice Wall making truly impenetrable servers that can potentially make you money with Commercialization. When ready to score, you can Trick of Light advancements If you have any spare influence, a couple Space Camps in archives make for a nasty surprise. What's great about the Crisium Grid, Ice Wall combo is that the pieces are only 1 influence a piece, leaving plenty of breathing room for things like Jackson. 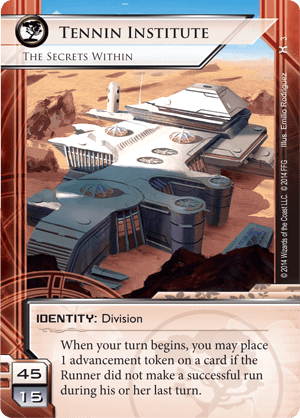 Much like Industrial Genomics: Growing Solutions, this deck can be a ton of fun to pilot, even if it isn't the most tournament worthy.